This year's LAMAS Conference at the Museum of London provided its customary interesting fare with its usual mixture of short lectures on current research in the morning and lengthier afternoon ones on a set theme. The attention of HADAS members (we counted 18 in the audience) focused on the second speaker of the morning session Ted Sammes, who talked about the HADAS dig at Church Terrace. With only 20 minutes at his disposal, he chose to concentrate on the finds rather than the struct­ural features of the dig, after discussing the considerable documentary evidence for the early settlement of the site, close to St Mary's parish church, Hendon. Ted began his clear and well-illustrated talk by considering the earliest pottery from the site - sherds of Roman colour-coated ware; poss­ibly from the Nene Valley, and a delightful face-mask from a flagon. There are also sherds of Saxon vegetable-tempered ware, in themselves nondescript but Ted indicated that the amount over 400 grams - is significant he described a beautiful double-headed in-turned spiral pin as the prize find of the dig. It has been dated stylistically to the Dark ages, although it was found in a later context. From a 13th c ditch have come two rather puzzling pieces of Purbeck marble. Ted indicated that animal bone from ditches on the site provides evidence of a much more open habitat than is usually considered to have existed in the north London area. Four burials were discovered, not unexpected so close to a church yard. They were rather decayed, due to damp and the acidity of the soil, and unfortunately the best skeleton was vandalised. Medieval pottery includes sherds of Surrey and Herts grey wares and part of a 15th c lobed cup, not of the best quality which perhaps indicated local manufacture, but nonetheless rather pleasing. Over 40 pins were discovered in a layer of plaster. Ted's research on a polychrome Delft tile has led him to consider it could have been made in London, while he thinks small yellowish bricks, found in large quantities on the site, might be Dutch in origin. These excited some comment from other archaeologists at the exhibition of prinicipal finds set up in the Museum Education Department. More modern finds include the neck of a spa water bottle, chamber pots of redware and pearlware and Chinese-type bowls and tea cups. while Lesley Atkins talked of the difficulties of excavating a Roman villa onan old sewage farm at Beddington. Two members of the Museum of London staff described their finest recent acquisitions: Jean Macdonald on an unusual Iron Age bronze brooch found by a treasure hunter on the Thames foreshore'; and John Clark on the widely reported find at Foster Lane of 50 fragments of 14th c glass decorated with coloured enamel*. Steve Roskams' lecture on the construction techniques of the Roman and medieval waterfronts at Billingsgate heralded the theme of the afternoon session: archaeology and the river Thames. This session began with a rather technical account by John Penn of river mechanics. One HADAS member at least lent it a especially attentive ear: Sheila Woodward, who said afterwards that she got some useful pointers from it for the Prehistoric Group river walks in Edgware. Then Stuart Needham discussed the role of the Thames in prehistory in fostering cul­tural contacts between peoples. This study was based not just on artifacts found in the river but also on settlement sites which still exist along it, many awaiting proper investigation. After tea, Peter Marsden entertained us with a lively lecture on the evidence for Roman and later shipping found in the Thames. Apparently London is lucky in providing more information on shipping than any other European city, possessing no less than three Roman wrecks, two medieval and one dated to the time of the Great Fire. Now waterfront excavations are providing more information on ship construction from re-used timbers and are also setting the ships in the wider context of contemporary quays and dock, facilities. Peter's account of the joys of working within a coffer dam, high tide 40 ft above his head, feeling changes in pressure as shipping passed by, was nicely calculated to send any archaeologist home well content with even the most urban of sites. *An exhibition of these unique enamelled glass beakers will be on display in the Museum until midsummer this year. Sun May 15 Museum of London talk and walk. Meet at the Museum, London Wall, EC2 at 12.20 for talk with slides in Education Dept at 12.30. Packed lunch may be eaten there afterwards, followed by a short session in the galleries at 2 pm when the Museum opens. The walk will begin about 2.30 and end about 4.30/ 5 pm. Full details in the enclosed application form which please complete and return to Dorothy Newbury if you would like to take part. NW4 to be chaired by Vice-President Mrs Rosa Freedman. Coffee 8 pm, business meeting 8.30, followed by Percy Reboul's presentation of an illustrated lecture, first given on Nov 2, 1963 (24 years after the Society started) by our founder, Thermistocles Constantinides. Mr "Constans" later recorded his lecture and the recording was recently discover­ed in the Local History Collection, accompanied by the original slides. Percy has transferred it to cassette tape for the AGM. He believes this will be the first time recorded sound has been used in one of our lectures. The Roman Group (who enjoyed a successful visit to the Welwyn Bath­house early in April) announce that they hope to do some much needed main­tenance work on our College Farm premises in the weekend of hay 7/8. This will be'(literallY)a white-washing job. Volunteer helpers will be warmly welcome, but please let Tessa Smith know in advance, on 958 9159, if you intend taking part. P.S. You don't have to be a Roman enthusiast to wield a nifty paintbrush!. The Documentary Group continues with a number of long-term projects, most of which have already been mentioned in the Newsletter. .One which will shortly come to frui tion is researching and writing up material on the links which the Express Dairy Company - oldest of London's individual dairies - has with the Borough'of Barnat. LBB Library intend6 to pUblish this as an illustrated booklet, called Milk for the Millions, in the near future. It is the story of the Barham family, because the Express Dairy is the business Barham built. The booklet deals with the huge interwar bottling' plant built at Cricklewood - in its time thO biggest milk bottling works in the world; with the experimental kitchens and laboratory at Colindale; with the farm for milk-delivery Welsh ponies at Frith Manor; and-with various other places in the Borough which had Express assodations. Anyone want a good cot, good mattress, left from Minimart? ,£10 or best offer. Phone Dorothy Newbury 203 0950. KATE BALEN, our junior representative on the Committee, asks us to say that there will be an outing specifically for junior members to the museum of London on the afternoon of Sun. May 8, at which all junior members will be welcome. Meet outside the main door of the Museum at 3 o'clock, but please let Kate kmow (on 202 0347) if you intend coming, so that she can look out for you. If you have-any suggestions for further junior meetings please let Kate know. You may be interested also to know about the Young Archaeologists Club, which is open to all between the ages of 9-16.years. For a sub­scription of 2 a year you get a magazine called Young Archaeology which contains information About competitions,, projects and sites you can visit; Further details from Dr Kate Pretty, Young Archaeologists Club, New Hall, Cambridge. Send an sae. - summed up by Brian Hobby as the first ever conference to.be held in Britain on Roman town planning." Again, it is almost impossible to pick out even the highlights from a crowded two days of lecture and discussion. Eighteen papers were delivered, many by speakers whose names are household words in Romano-British circles; Professors were two-a-penny: Barry Cunliffe, Malcolm Todd, Sheppard Frere, 0 A W Dilke, John Wilkes, Martin Biddle. Some of the subjects provided unexpected insights. Sheppard Frere, for instance, spoke on civic and family pride as a factor town planning. He pointed out that certain matters were often dealt with by the rich, so that they became almost a form of surtax: transport, for instance, enter­tainment, food (the giving of public banquets) and public building. A group of prominent local families might donate 3000 sesterces each towards the building of a basilica; or one leading figure might provide 30,000 sesterces for a market; and there was an instance of two million sesterces being given for constructing an aqueduct - but that was "munificence beyond the line of duty." Someone might pay for a street to be metalled; for a fountain and the -laying of .the_bronze-pipes to or or a portico for the public bathhouse. At Wroxeter.-. as an example of communal rather than family pride ­the temple was erected by the "civitas Cornovii."' The provision of such buildings was a mark of rank and status - just as in Julio-Claudian times, a rampart and a bank were a mark of rank for a town: which explains why some towns were not walled until the 3rd century. Then Dr John Casey of Durham University brought the noisy, crowded, jostling, quarrelsome city of ancient Rome to life with his vivid and exuberant description of the Roman property market of the early centuries AD. Some of his statements about developers and lawyers wouldn't have' been out of place today. Much of the evidence comes from Rome itself -a "jerry-built city," he called it - but he felt that it could be extrapolated to cover the provinces, where legal problems must have been similar. Investment in urban property paid good dividends, but was risky.' You might lose your shirt because the buildings you owned burned down. Early 1st c jurists' reports provide a body of law about the relation­ship of owner and occupier. Roman law had a strong bias towards the former. There was practically no security of tenure. In an Egyptian document of the 5th c, for instance, the tenant undertakes to lease a room on the ground floor, with appurtenances, and to surrender it, in good nick, when­ever his landlord wishes. The tenant was at an advantage, however, in that he never had to pay in advance. His rent was normally paid once yearly, or at the end of his lease. Annual payments were at the end of June, and if a tenant defaulted then, the landlord could, on July 1, distrain on his goods. According to certain Roman writers it was not uncommon in the last week of June to see people staggering along the street under various articles of furniture. On rented property change of use was not allowed - i.e. you couldn't put up a partition to turn your rented room into an office and a living room. Leases specified repairs to be made when the property was given up; in­cluding particularly the proper reinstatement of doors and windows. Property could be sold by auction or by private treaty. Two advertise­ments for sales are known from Pompeii. Dr Casey reckoned there were rich pickings for lawyers practising at the Roman property bar; many houses were divided (vertically, never horizontally) so that you could buy a small part of a house. There is evidence in a document - we would call it a convey­ance preserved in ultra-dry conditions on an African site, of someone buying 2/15ths of a house - and, of course, paying full legal fees. HADAS members will know Stephen Castle for his digs at Brockley Hill, but in the last few years he has turned his attention to later periods by carrying out a comprehensive survey of the buildings in Elstree village. Recently he contacted HADAS to report a new discovery. The 'Corner Shop' site at the junction of Barnet Lane and Elstree High Street (TQ 1782 9523) is in fact occupied by two shops, currently selling children's clothing and antiques respectively. The rooms above these pre­mises are at present being converted into a dentist's surgery, and it was during this work that a roof of late medieval date was revealed. By a process of painstaking observation Mr Castle has discovered the remains of a 3-bay timber-framed late medieval hall house. Features dating the roof to about 1500 include the use of small king-struts in the two central trusses, with queen-struts in the north gable of the end truss, and the presence of curved wind-braces. The generally high quality of the woodwork (all oak) also confirms such a date. The original width of the building was about 4m; its length along the High Street front­age probably more than double this, the building being constructed in 3 bays. It is clear that the northernmost bay was separated from the 2-bay open hall by A partition, its rafters, unlike those of the hall, not being soot-encrusted. A fragment of late medieval octagonal window mullion was discovered in the back wall of the open hall. During the 17c it was decided to add an upper storey to the original structure. The roof was removed and oak posts about 1.5m high were tenoned to the top of the wall plates. A new tie beam was added at the N gable end and the roof re-assembled. At the same time the central tie beam of the open hall was moved about lm away from its original position, presumably to accommodate a larger window. Two sets of carpenter’s numerals are visible on the roof timbers; one in correct order from the rebuild, the other original set somewhat out of order showing the roof beams were not all replaced in correct position. During the 18c the frontage of the building was faced in red brick, hence the present *Georgian* appearance, and in the mid to late, 19c a large brick fireplace was inserted at the south end. Part of the S end of the building was demolished c 1900 to facilitate the construction of High Street House next door. In the later 19c the yard to the rear of the shop saw the building of an abbatoir and the extension of the living accommodation. Although the current conversion work is likely to conceal much of the medieval structure it is intended that the original roof is exposed to view. Stephen Castle has almost completed his investigation of the buildings of Elstree village, and hopes to publish detailed drawings and histories of each building as part of a village survey. A more expert and detailed account of the history of the *Corner Shop' will be included in it. Note: Mr Castle also advised us that a service trench might be cut across the back garden of the *Corner Shop,' and kindly put us in touch with the owner. We have now negotiated permission to site-watch, as soon as any work takes place - so expect a further site report in due course. With the April Newsletter I sent out reminders about subscriptions, so I look forward to receiving yours (unless of course you've paid it already) in the near future. New members who joined since Jan 1 1983, can ignore this - their first sub takes them up to March 31, 1984. As before, I will save your stamps (and thanks to those who have given me more stamps over the year) to give to charity. The last I gave to the Friends Society, who acknowledged them with thanks; I will give the next lot to Cancer Research. Incidentally, I have been asked by some members if HADAS collects green shield stamps. The answer is that we have stopped doing so, but I suggest they might also go to Cancer Research. This recent publication is sub-titled "An account of the excavations at Trig Lane, London, 1974-6 and related research." The excavations re­vealed a series of timber and stone revetments dating from the 13th-15th a. The waterlogged conditions preserved the timberwork which survived in places to a height of 2 metres. The detailed excavation section has many photographs and drawings of the timberwork in situ, all of which have been very well reproduced and are of the high standard that we have come to expect from the Dept. of Urban Archaeology. The analysis includes information on the dating, the original form of the' revetments and the development and use of the waterfront. 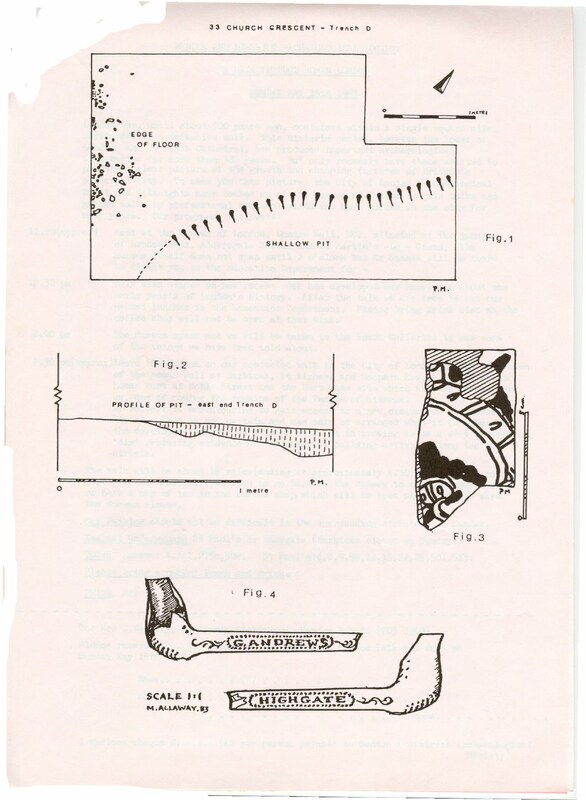 The text of this report was completed in 1980 and many finds, which came from specialist reports on Dendrochronology and C14 dating, Coins, Jettons and Tokens, Pilgrim Souvenirs and Kindred Objects and the Pottery. The pottery was sampled and the dating evidence given is based on the Surrey White Wares. Few people are likely to sit down and read this report in full, but members interested in medieval carpentry, urban drawing and photography or the combination of a detailed structural report with analysis and research should certainly borrow it from the HADAS Library or buy it from LAMAS at the Museum of London. Price £10 a £l p & p.
As mentioned in the April Newsletter, we recently applied for and obtained a small award for a prismatic compass for more accurate survey of the earthwork in Hadley Wood. We were invited to a presentation party at the Society of Antiquaries in Burlington .House by the Royal Archaeological Institute, which organises the award fund on behalf of Lloyds Bank. It was suggested that. as your Treasurer, should go along to collect the cheque.I went expecting a brief and somewhat formal affair. The presentation however proved very interesting and was. followed by an equipment exhibition and some generous refreshments - all provided through the generosity of Lloyds Bank. Fifteen groups received' awards and each had to give a brief comment its project and activities and say a word of thanks to the Lloyds Bank chief general manager, John Davis, who made the presentations. The projects varied from Bronze Age cairn surveys in Scotland to photographing furniture and buildings in Lancashire; from Neolithic sites in Thanet marshes to organising a children's archaeological group in Northumberland.. It was interesting that the objectives for which awards were made ranged far more widely than is usually permitted by more academic awards and grants. For instance, part of one award was earmarked for help with publication of results - something that is often explicitly excluded from other types of archaeological award. There was an award of £2OO for specialist reports, including C14 dates for bones. Camera film and a tape recorder for oral history were two others - so Lloyds cast an admirably wide-net.The machinery exhibition included new surveying equipment resistivity survey instruments and new magnetic instruments capable of detecting small soil variations including ancient ditches, pit. and even sites of fires; literature on some of these has been-lodged in the HADAS library at Avenue House*. Supervising the event for the RAI was Andrew Selkirk, who is also HADAS member. I talked to various representatives from other societies, some of them HADAS had visited in the past. The Nene Valley society, in particular, asked to be remembered.to old acquaintances and said they would welcome further visits. *Note: Members who take Current Archaeology will find an excellent piece in the March 1983 issue (p93) on the very latest in machines: an advanced magnetic susceptibility meter, which costs around £600 and specialises in looking at the topsoil. It is suggested that it will be particularly useful when used in conjunction with phosphate analysis ... to distinguish houses or areas occupied by humans.and those occupied by animals. We have now found, measured, taken bearings on and plotted onto the 1/1250 OS sheet nearly the whole circumference of this egg-shaped feature, measuring some 300m. E/W and.200m N/S. We have copies of a sketch plan published in 1920, and of a scale plan published in 1952; some features indicated on these are no longer trace­able (at least not in the location where they are shown!) This may be due to erosion or disturbance but clearly very careful search is needed to establish what has been lost in the intervening years, and whether we have found any features not noticed before. We plan another field exercise - for which we could happily use up to 20: volunteers - for Sat. May 14 next. Meet at the railway bridge in Hadley Wood (TQ 263 972) unless it's pelting (a little drizzle won't put us off). Bring a picnic lunch if you like, but three pubs nearby serve food. Clothing should be waterproof and thorn proof, and headgear would save scraches, especially for those not liberally endowed with hair, Pencil, notebook or clipboard: and secateurs useful. Please come if you can. It would be helpful if you let Brian Wrigley (959 5982) know your intentions beforehand. He began by describing the work carried out in the metallurgical section of the. British Museum Research Laboratory. Their job was to decide how artifacts were made and what they were made of. What they could not say was why they were made. The first step was to visit the site and find out as much as possible from the production debris. Samples were then tested in the laboratory using modern technique's and instruments. Later simulated furnace runs were carried out. Metallic objects first started appearing about 10,000 years ago. They were very small - mostly gold: and copper beads - and were no doubt fabricated from pieces of metal found lying about. Soon native metal ran out and man learnt to smelt the ore from which it came. The ore itself was often in fissures in the massive rock, from which it had to be extracted This was done with the 'grooved axe' -a sizeable stonewith a groove round it; Rope was wound around the groove, with enough left over to form a handle so that the axe could be swung - often in a confined space. These axes are found in large quantities around old mining sites; pock-marks on the rock face are often visible. By the year 2000 BC the industry had expanded vastly - this was the period of the Bronze Age empires. Besides western Asia, sites are known in Cyprus, the.A3alkans and Spain. Bronze picks were used to claw out the ore. A typical example is the copper site Timna, Southern Israel, where some 6000.Vertical shafts were sunk at this period, involving great numbers of workers. Thousands of tons of production debris are scattered around, consisting of slag, furnace linings, broken tuyeres unsmelted ore, charcoal and small pieces of metal. All these can be tested in the laboratory to establish working conditions. The-furnaces were cylindrical and quite shall - about 20-30 cm diameter and 1 -1½m high. Crushed ore and charcoal were fed into the open top, while air, pumped by bellows, entered through one or two tuyeres at the bottom. The molten contents ran into a shallow depression before the furnace. The British Museum is also involved in a project at Rio Tinto, SW Spain - the largest massive ore body in Europe. Some 20-40 million tons of slag and debris remains, mostly the result of Roman greed for silver. However the mines have been in use from at least the.4th c BC. Another site under examination is Zawar India, where large inclined airy shafts had been driven into the zinc ore-body. The debris included thousands of fire-clay retorts, many of which have been used by the neighbouring villagers to build walls. Associated with the mines are three-Jain temples, which Dr Craddock dated to approx 14th/15th .c - Some 400 years earlier than zinc distillation in Europe. The lecture concluded with: a series of slides showing experimental furnaces being,operated under simulated conditions - not the most comfort­able, of tasks operating a foot-bellows continually for & hours! We thank Dr Craddock for a most fascinating and informative evening. Many HADAS members have experience of and enjoy churchyard recording, so we regret that we did not have sufficient details to tell you in the last Newsletter of a project which starts in the May Day weekend- April 30 and May 1 & 2. However, it seems likely to be an on-going event, so you may be able to help later on. The General Arts subcommittee of Barnet Borough Arts. Council (HADAS has long been affiliated to BBAC, and is represented in its general arts section) is sponsoring the. recording of all tombstones in Christchurch Graveyard, St Albans Road, Chipping Barnet. This is a relatively modern graveyard of over 2000 graves, opened in 1901 and officially closed about 1970, although some family graves are still in use. Its upkeep has been taken over by the Borough. BBAC held a meeting at the end of January to inaugurate the project and HADAS member Harold Cover, who has recorded tombstones for us at St James the Great, Friern Barnet and at New Southgate Cemetery, went along to it. He will be keeping in touch with events, though he won't be present at the first weekend. The project is already off to a good start with the Borough Surveyor's Department offering co-operation in clearing weeds, etc and providing a full plan of the graveyard; and the North Middlesex Family History Society checking the parish burial registers, which fortunately carry the plot number of each burial. If you get your Newsletter in time, and are interested in helping, turn up on any or all of the first three days, between 10 am-4pm. Bring a Picnic lunch, but coffee will be available. Equipment in case you have not recorded before, and beginners will be very welcome should include clip board and pen, wellies if it's wettish, kneeling pad, trowel, soft brush and - for overgrown areas - secateurs. Later sessions at Christchurch will depend on progress made during the initial weekend and that, in turn, may well depend on the weather). .No further dates have yet been decided, but you can get further information from the organiser, Mrs Doreen Willcocks,. This was held at Brighton Polytechnic, Sussex, from April 10-15 last. It was attended by over 200 people from Britain and abroad, including America, Hungary, Germany, Sweden and France. It was interdisciplinary, with sessions ranging from the origin of Chert and Cretaceous chalk to the -Quaternary era, flint technology and microwear studies. For each session there was a keynote speaker whose lecture gave a general introduction to the seminar and a review of recent work in the field. The conference was opened by an amusing lecture by Professor Schmid from Hanover on Flint and Cretaceous stratigraphy in NW Europe. A nice touch was added by a presentation of his favourite piece of red flint to Mr G de G Sieveking, the chairman of the conference. Local excursions were arranged for the Wednesday afternoon and for all day Thursday to see the local chalk stratigraphy and flint bands at Seaford and Beachy Head and to visit Quaternary sites at Asham Quarry, Lewes, and at the Devils Dyke, near Brighton, where research is in progress. Most memorable was the visit to the Neolithic flint mines at Harrow Hill near Worthing which had been excavated especially for the conference. At the end of the week there was a long field excursion to visit Grimes Graves in Norfolk and then to see chalk and flint stratigraphy in North Lincolnshire. The conference gave insight into current work being carried out by archaeologists and geologists involved with flint both in Britain and abroad. Thanks must go to the organising committee and especially to Mr Sieveking and Dr R Mortimore who so successfully masterminded the operation. HADAS Newsletter of February, 1982, contained a report of the excavations carried out in 1978 on the site 'of the Victorian Rectory of St Mary-at-Finchley, Hendon Lane, N3. The plan of the site accompanying that report also indicated the position of Trench D, excavated the following year in an adjoining garden in Church Crescent. The purpose of opening Trench D was to ascertain if a pit or ditch with a gently sloping profile (shown in Fig 2 of our earlier report) extended into 33 Church Crescent and, if so, to establish its purpose. In the event, part of the lip of a shallow pit was found (Fig 1 herewith) but it could not be established if this was related to the feature in the old rectory garden. Fig 2. shows the profile of the pit at the east end of the trench. The area of excavation was limited by the-presence of a garage build­ing and other factors, so we were left with a variety of interesting, but puzzling, features, one of which was the corner of a floor of sparse cobbles (Fig 1). Along the lip of the pit were numerous pockets of small concretions of deteriorated metal which, though not responsive to a magnet, were identified by the laboratory of the Museum of London as being derived from iron. Similar fragments found amongst the stones of the nearby floor suggest an Association between the two, features, perhaps of an industrial nature. Because of the extensive transference of soil and building materials around the site at the time the Victorian Rectory was built, the exact locations of find-spots, though recorded, are of limited significance and are not indicated in the following summary of the more interesting finds from both the Rectory and the Church Crescent sites. Prehistoric: 4 struck flint flakes from the Rectory garden have been drawn and recorded by Daphne Lorimer, who writes: "three show signs of retouch and/or wear and are of Mesolithic type." Two additional flakes of similar type were found at 33 Church Crescent. Portion of base and three sherds of gritty red ware 12th/14th c, 16 assorted sherds in red-ware, 8 with traces of green or brown glaze. One small sherd, pinkish fabric, yellow glaze; possibly Stamford ware, 10th/11th c (?). The four trenches which were excavated, As well as several rubbish pits disturbed by recent builders' operations, all provided large quantities of 18th/19th c pottery, stoneware, bones and oyster shells. Some fragments of wine bottles were of globular 17th -c type. 6 small fragments of sheet glass, about 1 mm thick and partly degraded, are probably of considerable age. The neck and mask of a Bellarmine wine jar are of 17th c type. 35 portions of clay tobacco pipes include the Highgate pipe mention­ed in oar earlier report (see Fig 4 herewith); also one bowl of period 1660-80 and a spur with initials 'D.C.' (perhaps Dan Crabb of London, c.1723). Cornet of blue-and-white glazed ceramic tile is illustrated. (Fig 3). "Both the grey interior and the brown exterior of the flint consists of finely crystalline quartz (films X8216, A, 8217). No impurity was detected on the films, but the brown 'shell' to the flint presumably contains some iron oxide." To this Miss Woodward adds: "We can offer no explanation as to the origin of colour or surface layer." When first found, the flints wore quite a bright blue colour. Miss Woodward explains: "The core probably appears less blue than when found due to natural drying-out process ... moisture seeps into the tiny spaces between the minute quartz crystals of which it is composed." I am personally grateful to Mrs Daphne Lorimer, Miss C M Woodward, Mr B R Young (of the Institute of Geological Studies), and the laboratory staff of the Museum of London for help as indicated in the above report; also to Mr John Clark of the Museum of London for his advice and the opportunity to examine pottery in the Museum's reserve collection; and to Mrs Mary Allaway for her drawing of the Highgate clay pipe.